Victor Billingsworth, an enthusiastic club runner from Hemel Hempstead today completed the London Marathon in an elaborate costume of running singlet, shorts and trainers, much to the amazement of the millions of spectators that lined the route. "I couldn’t believe what I was seeing," said Jane from Colchester. "The children said that there was a funny man on the course and when I looked I was astonished not to see him in a dress, a Storm Trooper outfit or in a Womble suit." Mr Billingsworth said that he had wanted to stand out from the thousands of charity runners taking part and wanted to be sure to be seen by friends and family who had come to support him. "It is probably the most difficult part of your pre-race preparation," said Victor after he completed the course in a personal best 3 hours and forty-four minutes. "You spend weeks trying on different outfits to get the right look. In the end I went for a red running vest. My friends thought I was mad." Mr Billingsworth’s wife, Simone, said that she thought he was insane to attempt to run over twenty-six miles in the outfit of a runner. "I was worried he might get cold, what with not having the fur of a large teddy-bear costume or the sun-catching, dark garb of a Batman outfit," she said. "All the attention his outfit has been getting is embarrassing." Not only did Mr Billingsworth not even doff his cap t tradition by the simple act of cross-dressing, he completely failed to take along even the most basic of marathon running equipment. "I did get a few comments from people who wanted to know where my bucket to put cash in was, or why I wasn’t pretending to ride a large, blue ostrich," said Billingsworth. "But that just motivated me further to show all the doubters and do my talking through my times through each checkpoint." 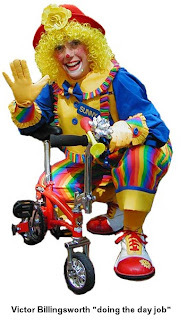 Mr Billingsworth, a children’s entertainer and professional clown, said that his first round of sponsorship for the marathon dressed as ‘an average runner’ had so far raised over £3m. That's really cute) I love the people who makes other people laugh no matter what the situation is. I think this is how I pick my husband) He may be not the best man in many things, but he always could make me smile. And write a narrative topics samples for me, when we were at uni))) Just kidding.